Facebook has become one big fertile ground for information thieves, hackers and viral spam posts. Despite this, Facebook has done very little to protect its users from all of that bad stuff. So what, someone had to create a Facebook app to protect us from all that spam. Two University of California, Riverside graduate students who work for a Web protection service company called StopTheHacker.com run by an alumnus Anirban Banerjee, who received his Ph.D. in 2008 from UC Riverside and Michalis Faloutsos, a professor of computer science and engineering at the university have partnered and develop a free Facebook application that detects spam and malware posted on users walls and news feeds. 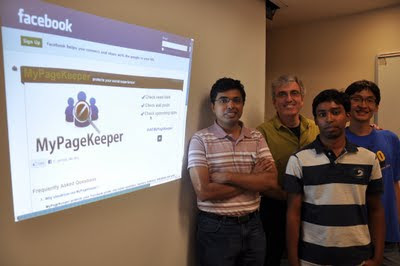 The app is called 'MyPageKeeper' is an effort of Md Sazzadur Rahman and Ting-Kai Huang who are currently Ph.D. students in computer science at UC's Bourns College of Engineering. The app is in beta stage. The application works by continuously scanning wall-posts, news-feeds and links posted by friends of users who install this app. As soon as any malware, spam or other undesirable material is detected. MyPageKeeper notifies the user and enables the user to remove the malicious content from their profile/wall. On a personal note, its something really useful for a skilled user who can spot the difference or who regularly monitor their profile for spam content, but this is really good for the less aware/unskilled users who really don't understand the difference, and that's what forms the major user base on Facebook. If Facebook makes MyPageKeeper app official, I think it will make Facebook a more safe place for your personal information to reside in.